European pear: Pyrus communis L. This pear tree species does not occur in nature, and possibly derives from P. caucasia and P. nivalis (snow pear). This is the major pear of commerce. Asian pear: P. pyrifolia (Burm. f.) Nak. [syn. P. serotina L.]. Also called “Japanese” or “Oriental” pear, or “Nashi”. Grown mostly in the Orient, this fruit has been increasing in popularity in the USA over the last 20 years. 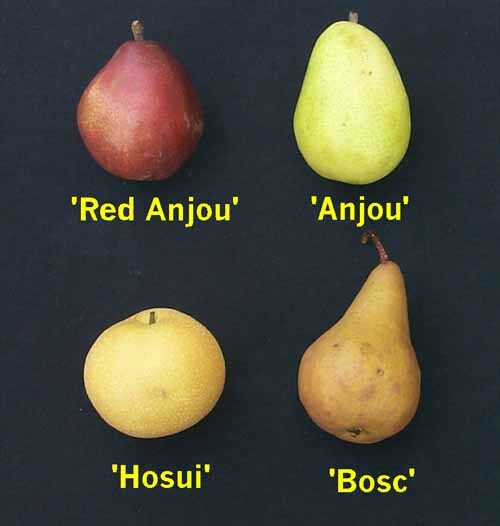 In this picture, ‘Hosui’ is an Asian pear, others are European. Asian pears appear more like apple than European pear, and have hard, crisp flesh like apples when ripe, unlike the melting flesh European pears. Also, Asian pears will ripen on trees like apples, but European pears are subject to core breakdown if allowed to ripen fully on-tree. There are relatively few cultivars of European or Asian pear grown worldwide. Only about 20-25 European and 10-20 Asian cultivars represent virtually all the pears of commerce. Almost all European cultivars were chance seedlings or selections originating in western Europe, mostly France. All of the Asian cultivars originated in Japan and China. ‘Bartlett’ is the most common pear cultivar in the world, and represents about 75% of US pear production. Like its relative the apple, the European pear is not found in the wild. Its probable progenitors are native to Eastern Europe and Asia Minor near the Mediterranean, but it is not known when they may have hybridized to yield P. communis. The European pear has been selected and improved since prehistoric times, and was cultivated in Europe in 1000 BC. Pears probably came to the new world with the first settlers on the east coast, and spread westward with pioneers. When moved to the Pacific northwest in the 1800s, European pears were able to escape fire blight, a serious bacterial disease that limited pear cultivation in the east. 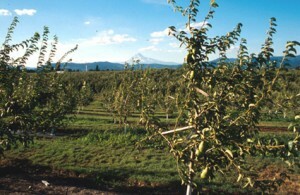 Today, over 90% of the pear crop is grown in the Pacific northwest, such as the Hood River Valley of oregon (shown), and California. Asian pears were domesticated in China about the same time European pears were in Europe, 3000 years ago. P. pyrifolia is native to central and southern China, and probably the first to be domesticated since fruit of wild trees is edible. Fruit of wild P. ussuriensis is astringent, small, and course-textured, so that it was probably hybridized with P. pyrifolia prior to domestication. Chinese writings dating from 200-1000 BC describe pear propagation and culture. Asian pears moved from China to Japan, Korea, and Taiwan, where they are cultivated commercially today. World (2004 FAO) – 17,909,496 MT or 39.4 billion pounds. Pears are produced commercially in 81 countries on 4.3 million acres. United States (2004 USDA) – 812,054 MT or 1.8 billion pounds. Pears are produced in 9 states on 65,000 acres. Yields average 29,000 lbs/acre, about 3 times the world average. The industry value was $296 million in 2004; growers received 16 ¢/lb in 2004. The leading states are WA, CA, and OR, in that order. 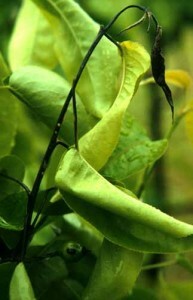 A medium sized, upright growing tree, to 30 ft tall, generally 8-18 ft in cultivation. 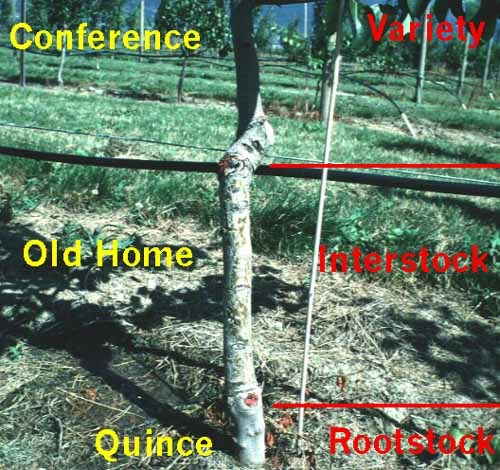 Pear tree size is heavily dependent on rootstock and training system. Leaves are elliptic/ovate with acute tips, with finely serrate or entire margins, 2-4″ in length. Flowers are about 1″ in diameter with white petals, and similar to apple except for having longer pedicels. The inflorescence is corymbose, containing 5-7 flowers (also different from apple). 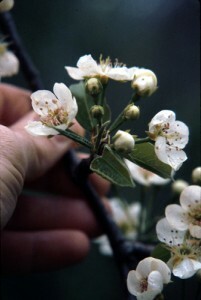 Most cultivars require cross pollination for commercial fruit set. 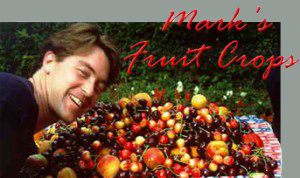 Some cultivars are partially self-fruitful – ‘Bartlett’, ‘Orient’, ‘Baldwin’, ‘Kieffer’, ‘Spalding’. Honey bees are the main pollinator. A pyriform (European) or round (Asian) pome. As in apple, the fleshy edible portion is derived from hypanthium tissue. There are 5 central seed cavities, usually bearing 2 seeds each as in apple. The flesh contains grit cells (termed brachysclereids), which are thick-walled, lignified cells that give the characteristic European pear flesh texture. Pears are thinned to 1-2 fruit per spur, spaced 6″ apart. Pear trees tolerate heavy, poorly drained soils better than most tree fruits. However, productivity is best on deep, well-drained loams with pH 6-7. Pear trees have very similar climatic requirements to apples, but are much more prone to fire blight and therefore cannot tolerate humid, wet springs. Pears require 900-1000 chill hours to break dormancy, although some low chill cultivars exist, and many Asian pears have lower chill requirements and can be grown as far south as northern Florida. Pears have similar or slightly lower cold hardiness than apples, tolerating -10 to -20 F. Pears bloom 1-3 weeks before apple, and are therefore prone to frost damage in most regions. Pears mature in as little as 90 days, or as long as 200 days. ‘Bartlett’ and its sports are referred to as “summer pears” since they ripen in July – August in California (115-140 days). “Winter pears” are those harvested in autumn and marketed throughout the winter months, such as ‘Anjou’, ‘Bosc’, ‘Comice’, ‘Hardy’, ‘Winter Nelis’, and ‘Packham’s Triumph’. Standard sized pears are chip or t-budded onto compatible rootstocks like most tree fruits. However, where quince (Cydonia oblonga) is used as a dwarfing stock, most pear scions require an interstem for compatibility (of major cultivars, only ‘Anjou’, ‘Comice’ and ‘Hardy’ are compatible with quince, and all Asian cultivars are incompatible). Common rootstocks for pears [Modified from Westwood 1993 and Lombard and Westwood 1987]. 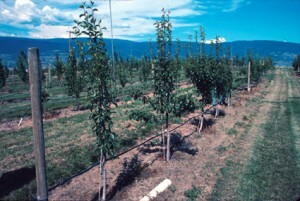 Pear orchards are designed very similar to apple orchards. Standard trees are spaced at 25 x 25 ft (70 trees/acre), but hedgerow forms are more common in high density plantings, with hundreds of trees per acre. Pollinizers are planted in alternate rows, or every 10th or 15th tree within hedgerows. The most common system is central leader for free-standing trees and some form of palmette for trellised orchards. Initial tree training is particularly important with pear since scaffolds tend to grow nearly vertically, causing poor crotch angles and delayed fruiting. Other than this tendency to grow upright, and therefore greater need for limb spreaders, pears are trained and pruned in the same way as apples. Fire blight (Erwinia amylovera). 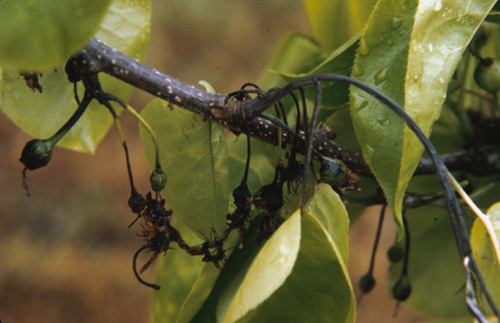 This is a severe bacterial disease for virtually all pear cultivars, particularly in warm, wet springs. The bacteria are carried by bees from tree to tree at bloom, and can kill all or most of the flowers on a tree if severe. Very susceptible cultivars show twig and spur dieback or complete tree death. Flowers, twigs, and leaves often turn black and wilt; shoot tips droop over, giving a distinctive “Shepherd’s Crook” appearance. European pears are harvested when “firm mature”; flesh firmness is the most reliable indicator of pear maturity. Firmness in the range of 10-15 lbs as measured by a pressure tester is desirable for most cultivars. Pears for are picked by hand several times over a 10-20 day period. Standard packing line procedures are used for pear – hydrocooling, washing, culling, waxing, sorting, and packing. Quality grade is based on size and appearance of skin; greater prices are obtained for larger fruit and those with minimal surface blemishes. Pears are stored just below freezing up to several months, then ripened for a few days at 70-75 F prior to consumption or canning. Unlike apples, pears are not subject to chilling injury. ‘Bartlett’ can only be stored for a few months, whereas ‘Anjou’ and ‘Winter Nelis’ can be stored for 5-7 months. In the USA, 55-60% of pear production is marketed as fresh fruit, and the bulk of the processed fruit is canned. Per capita consumption of pears in the USA was 5.6 lbs in 2004.